Everybody needs a white girl in their life…. Many of you guys have been asking for more info on my newest project/grocery getter that you have been seeing recently. I guess grocery getter is a bit of an understatement. This N/A Civic Si has always caught my eye. This car is no stranger to the track. Mike Chang, owner of Evasive Motorsports, purchased the car new. As you can remember, Evasive had a lot of fun with this car and landed a beautiful cover on Honda Tuning Magazine back in 2011 after doing the FD2 conversion and competing in numerous time attack events. As Evasive progressed into other project cars, they made the decision to find a nice new home for their FA5. Our friend and customer Renzo Marsano decided to pick up this beauty and bring it to us here at Sportcar Motion for the special Sportcar Motion touch! No time was wasted. 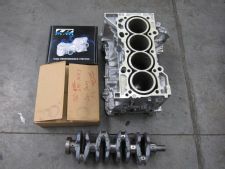 After just one event, we quickly assembled a fresh heart for the Si. This time around a brand new K20/K24 would power this grocery getter around the Southern California tracks and freeways. Renzo headed out to Super Lap Battle 2011 and ran 2:02 at Buttonwillow clockwise config 13. This was quite impressive as the car was on street tires. 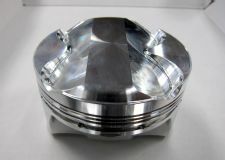 This was on the cars last stint as a K20 with just a Skunk-2 head package and stock bottom end. But, that just wasn’t good enough for all of us over here at Sportcar Motion. 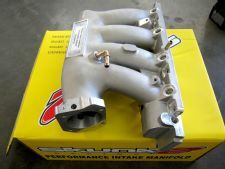 The freshly assembled K20/K24 was installed and tuned by our only trusted set of hands over at Church Automotive testing. After completing the new K20/K24 transplant, Renzo made his way back out to Buttonwillow and was able to run 2:00 flat in December 2011 on street tires. After attending the Modified Magazine Tuner shootout and having some more fun on open track events, Renzo made the decision to sell the car to it’s set of hands responsible for making her go faster. There was no hesitation in purchasing this vehicle. Between the Japanese full FD2 conversion on the exterior, and the absolute perfect combination for consistent power this was a no brainer. The FA5 now conveniently nicknamed “White Girl” now spends it’s life as a grocery/parts getter and part time track whore. From time to time you can catch her on display with her partner in crime Ken Suen’s FA5 nicknamed “Big Red’’. Soon you will also be able to catch Big Red receiving the same deadly combination of horsepower as White Girl for the upcoming time attack events to come in the end of 2012. More to come on this car as we wrap up a very fun and successful year. I am pleased to welcome “White Girl” to my stable of K-powered beasts! You can come check out White Girl next weekend at Nisei week in DTLA 8/11! 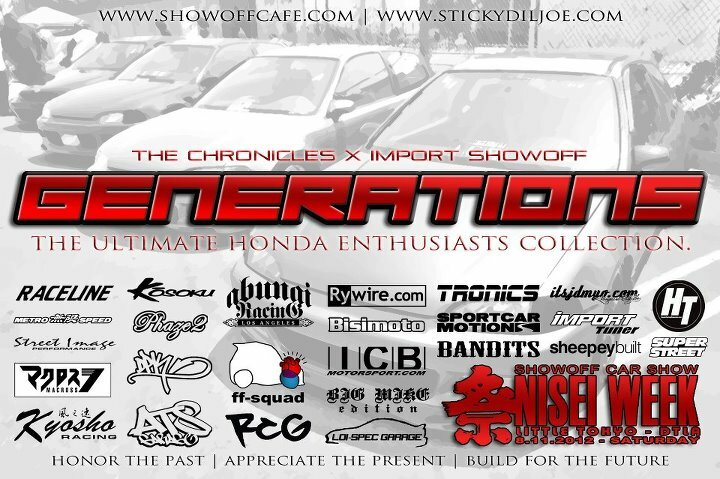 I will be at the Generations display with not one but three of our cars! Come by! This entry was posted on August 4, 2012 by Morgan Jade. 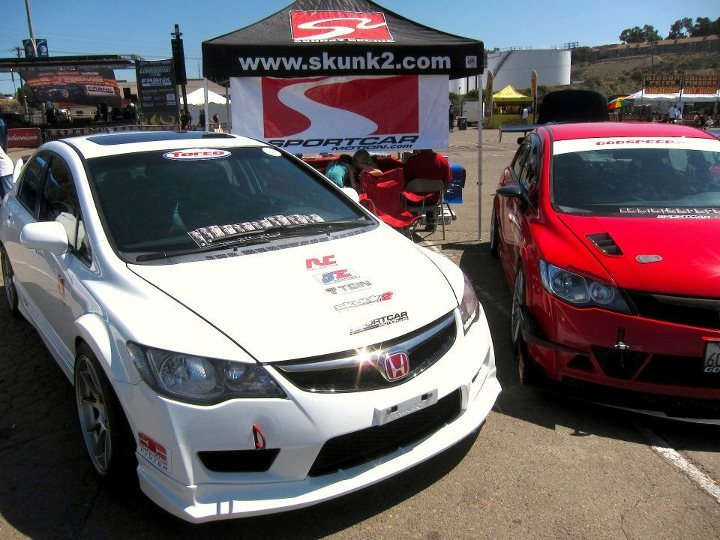 It was filed under Uncategorized and was tagged with girlracer, morganjade, Skunk 2 Racing, sportcarmotion.